I'm getting plants – yah to less toxins and bad EMF! I’m getting plants – yah to less toxins and bad EMF! I am on a search to make my living space more green and healthy. I did some basic googling and found lots of quacks and products marketed for people who are scared of toxis and any form of modern machinery/technology. Well it’s hard to find "scientific" studies that prove the removal of X amount of charged ion particles of electromagnetic radiation or X amount of toxins/sq feet. More or less, I will just go on the simple logic that having plants around me is a good for my health and decreasing the amount of time spent over electronics when I’m NOT actively using it (meaning when I’m sleeping), isn’t a bad idea either. Now I did find a scientifically "verifiable" study by NASA on plants as natural air detoxifiers, but I didn’t find any studies on EMF effects. So in regards to toxins, I found NASA’s study on the best air-filtering plants. Back in the 80’s, NASA was trying to figure out which plants to grow on the International Space Station (ISS) because when scientists conducted air tests on the ISS they found that the air was suuuuuppppper toxic due to all the human-made materials. As a result, NASA conducted a study on the best plants that remove the top 3 chemicals found in human-made products for everyday living: benzene, formaldehyde and trichloroethylene. Although we don’t live on the ISS, we are subject to these chemicals everyday and the greatest human exposure is the dangerous chemical of Formaldehyde – it’s in almost everything from particle boards to carpets to furniture. SOOOO the BEEEEEEST plants to remove all three toxins that was tested by NASA are: Bamboo Palm, Spider Plant (place this near wood or fireplace), English Ivy and Peace Lily (grow under artificial light!). NASA’s lists of the top 50 plants with air-filtering rate from 1-10 is in the chart below. I am going to buy three new plants that I just learned about – both are rated at 8.5 on the 1-10 scale: the Areca Palm because it’s a natural humidifier, Lady Palm because it’s bug resistant. Mother in-law’s tongue and Spider Plant because they are low-maintenance. I also like the rubber plant, snake plant (grows anywhere even with no light), and Christmas cactus ( put in bedroom because it gives off oxygen at night). The study recommends philodendron, but I would be careful of this plant because it can harm the body when placed too close – so if you buy this plant just don’t put it in your bedroom. 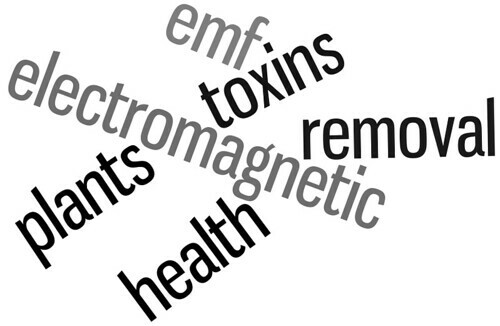 A google on EMF prevention reveals some super crazy internet quacks out to make $ $ . Let’s stay away from those! Now I’m not one of those people who freak out about being bathed in EMF. (ok I am lying – I freaked out for a moment when I saw Treehugger’s post on EMF and Maple trees– until I realized it was an old April Fools Joke). I have a weird sleep schedule because my life is crazy right now. I don’t blame any of my less than healthy habits on EMF exposure. That being said, I don’t think it hurts to educate myself on a topic that is very understudied. The Earth’s magnetic energy is at 9.6–10.2 Hz. Now what is interesting is that we are the first few generations to voluntarily subject ourselves to consistent flows of multiple sources of artificial EMF – e.g. cellphones plugged to our heads, ipods in our ears, cellphone towers above our buildings, and computers on our fingertips. So I think it would be nieve to say that there can’t be EMF effects when we surround ourselves with it and are already well aware of the effects of other forms of more dangerous and even Ultra-low non-dangerous EMF. High-EMF = Chernobyl = bad. One example of ultra low EMF is the relationship between our own body’s EMF and our pineal gland. The pineal gland is the endocrine gland in the our brain that produces melatonin and thus regulates our circadian rhythem (sleep/wake pattern). EMF could possibly affect your sleep. non-ionising EMR on health – e.g. exposure to visible light can delay pineal melatonin. don’t sleep with any alarm clocks, cellphones, laptops, chargers and etc in your bedroom. If you must sleep with them – like an alarm clock, then make sure that the alarm clock is at least 4 feet from your bed with a plant next to it. Try placing an EMF absorbing plant next to your computer – like cactus or african violets. I can’t find any conclusive "scientific studies to prove this – but I’ve been told by several traditional doctors that I trust and in these cases – the absence of "scientific" tests doesn’t mean that the knowledge of traditional doctors are invalid. Oh and don’ put a cactus in your bedroom or even buy too many big ones because cactus absorbs energy and you it can end up absorbing a person’s energy (as opposed to the computer’s)- which is no bueno. if you have a monitor, try to make sure it’s placed on natural materials – like wood or bricks. try to work on a desk that is made of wood. I am going to for my grandma. I’ll post an update about effective of reducing EMF pain for her. Although the Environmental Illness Resource Center says that they have not found any evidence of a change in EMF levels with the use of EMF-safety garments. A great article that reviews recent EMF studies is Gee’s (2009) report, Late Lessons from Early Warnings: Towards realism and precaution with EMF? Gee examines how EMF research can be a model for proactive steps to understanding and preventing potentially harmful risks in society. I like this paper because it does not get involved in the EMF is bad or good argument – rather it focuses on how take policy level action in reducing/understanding the risks of EMF. (2006), Frank S. Barnes, Chapter 8 – EMF Standards for Human Health.Electromagnetic fields and radiation: human bioeffects and safety (2002), Riadh W. Y. Habash. Green Leaves and EMF (2004), download PDF, Singh et. al, Proceedings of the National Seminar on Environmental Engineering. Winchester school food garden program.